Part eight will cover songs eighteen through twenty-one: “Guns and Ships,” “History Has Its Eyes On You,” “Yorktown (The World Turned Upside Down),” and “What Comes Next,” where King George comes back out to sing to us. “Guns and Ships” is one of my favorite songs of the musical. Lafayette is one of my favorite historical individuals, and his raps in this song are among the fastest in the musical. Let’s get into some of the history behind the lyrics, shall we? Burr calls Lafayette “America’s favorite fighting Frenchman.” Though it’s impossible to say with 100% accuracy that Lafayette was as Burr says, one needs only to look at the numerous receptions he received during his triumphal return to the United States in 1824 and 1825 to see that nearly 50 years after independence was declared, Lafayette was most definitely beloved by the American people. Our favorite fighting Frenchman comes out and raps, “I go to France for more funds (Lafayette!) I come back with more guns and ships.” As mentioned in Part 7 of this series, Lafayette sailed back to France on January 11, 1779 aboard the Alliance. He returned in April 1780 with a pledge from the French cabinet ministers of 6,000 men, 15,000 muskets, and clothing for the Americans. Lafayette tells us “the balance shifts,” and Washington sings, “We rendezvous with Rochambeau.” Jean-Baptiste Donatien de Vimeur, comte de Rochambeau was the commander of the French troops in North America. Following a number of naval disasters in the north, and a trip to the Caribbean, the French fleet returned to help the Americans. The combined American and French armies marched south (separately, a day or so apart), faking an attack towards New York City, before continuing the march to Virginia. The American and French armies eventually cut off the British retreat route by land, while the French fleet ensured the British could not escape the peninsula by sea. “Guns and Ships” goes right into “History Has Its Eyes On You.” This song is very short, but Washington’s lines at its outset refer back to the beginning of his military career. He sings, “I was younger than you are now / When I was given my first command / I led my men straight into a massacre / I witnessed their deaths firsthand….” Washington was given his first command (in the British army) in 1753, when he was twenty-one years old. 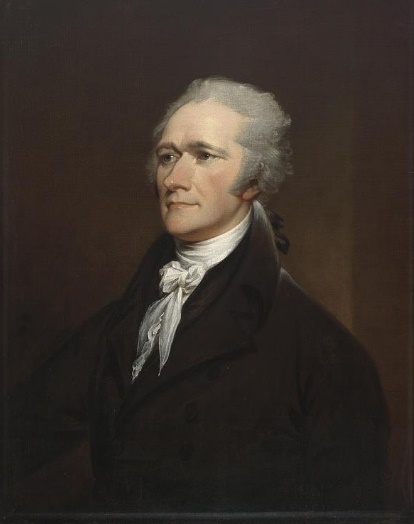 Using the 1757 birth date for Hamilton, he would have been twenty-four in 1781 during the Battle of Yorktown. Washington returned to let Dinwiddle know of the French’s refusal to leave the fort, which was the governor’s request of the French. Washington was sent out again, this time with instructions to forcibly remove the French from the fort. Washington and his Native American allies came upon a party of Frenchmen in the woods before arriving at the fort. The British soldiers under Washington surprised the Frenchmen and killed their leader. After learning that the French group was possibly a diplomatic party, and its leader was the brother of the commander of the fort, Washington and his men retreated. His Native allies abandoned him. Knowing the French were thirsty for revenge, Washington moved his men to a meadow where they hastily constructed a palisade fort, which he named Fort Necessity. The fort offered little protection to his men. When the French and their Native allies approached the fort, they were able to take cover in the surrounding woods, which were within range of the fort. Washington surrendered before the day was over. In signing the articles of capitulation, he accepted responsibility for the death of Jumonville, the leader of the French party he had attacked. (Washington may not have known what he was signing – it was written in French and translated into English by a Dutchman.) This episode was one of the events which helped to set off the French and Indian War. When Washington sings, “History has its eyes on me,” he had been aware of that for at least twenty years. Following the debacle in the wilderness, Washington hurried back to Virginia and wrote his own narrative, which he had published. Instead of being shunned, many saw Washington as a hero for taking on the hated French. Some argued that he hadn’t attacked a diplomatic party, but instead attacked a group of spies. When the French and Indian War began, Washington was disappointed that he would receive no higher commission and so he quit the military. But when General Edward Braddock arrived to attempt to dislodge the French from the Ohio River Valley, Washington offered to serve with him as a volunteer aide. Braddock accepted. Whether or not Washington warned Braddock about how the fighting styles of the frontier differed from those in Europe (guerilla-style warfare versus lining up for battle), Braddock marched in a long line through the woods. With the enemy surrounding the British and hiding on both sides of the road, the latter didn’t stand a chance. Braddock was killed, and it appears that Washington helped to lead the retreat. Washington explains this in those few lines of “History Has Its Eyes On You,” and then the musical moves on to the Battle of Yorktown. In “Yorktown (The World Turned Upside Down),” Hamilton asks Lafayette, “So what happens if we win?” and Lafayette responds, “I go back to France; I bring freedom to my people if I’m given the chance.” Hamilton tells him, “We’ll be with you when you do.” Lafayette was indeed a major figure in the French Revolution, and spent time imprisoned during the Reign of Terror, before being released at its conclusion. Hamilton, and the American government, was not with Lafayette when he tried to bring freedom to France, however. In the 1790s, Hamilton preferred a friendly relationship with the British at the expense of the French. Jefferson, who preferred a relationship with the French, refers to this abandonment in a later song. As the battle (and the song) progresses, Hamilton sings, “Take the bullets out your gun,” and the ensemble incredulously asks, “What? !” Hamilton’s men did attack the British redoubt with unloaded guns under the cover of night, and he suffered fewer casualties than the French who stormed another British redoubt with their guns loaded. In the next verse, Miranda changes history to keep his story interesting. Hamilton sings that his “friends all scattered to the winds. Laurens is in South Carolina, redefining brav’ry….” Laurens was not in South Carolina, however. In fact, as a lieutenant colonel, he commanded the left under Hamilton during the aforementioned attack on the British redoubt. After the battle ended, he served as the American commissioner to work on the terms of surrender. Staying more true to his story than to history, Miranda again veers from the historical truth when Hamilton sings, “We had a spy on the inside. That’s right, Hercules Mulligan!” Mulligan was a spy, but he wasn’t at Yorktown. One of the real spies who helped at Yorktown was an enslaved gentleman named James Armistead. At age 21, he was given consent to join the army and was placed under the command of Lafayette. Lafayette employed Armistead as a spy. He posed as a runaway slave, and the British hired him to spy on the Americans. At the end of July 1781, Armistead provided intelligence which allowed Lafayette to trap the British in Yorktown, and continued providing intelligence until the British surrendered. He returned to an enslaved life after the war, but in 1784, Lafayette, finding his former spy’s condition, petitioned for Armistead’s emancipation. In 1786, Armistead was emancipated by Virginia’s General Assembly. He added the surname ‘Lafayette’ to his own. And so we move to the last song for today – “What Comes Next.” And the answer is … King George! The only line really needing historical clarification in this song is “…now I’m fighting with France and with Spain.” The British were actually fighting with France and with Spain before 1781. France declared war on Great Britain in 1778, and Spain declared war on Great Britain in 1779. I usually do not like to link to Wikipedia, but it’s really hard to find a good timeline of Lafayette’s 1824-1825 tour in the U.S., and Wikipedia has one. This link provides four other links detailing the surrender of Fort Necessity and the articles of capitulation. He wrote letters to his mother and the Governor. The National Park Service has a history of the siege, as well as information on the roles of Hamilton, Lafayette, and Laurens in the battle. See the terms of capitulation here. Chernow, 165. You can listen to the song here.